Friends Together is gearing up for their first drive in 2017. 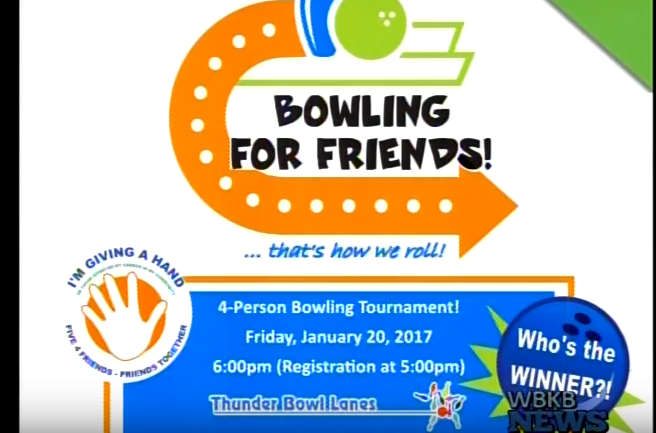 The organization will kick–off the new year with a bowling party for the 2017 Five 4 Friends campaign. The Five 4 Friends campaign is an event to raise funds to continue the mission to help out individuals suffering from cancer. The event will take place on Friday January 20th at 5:30 pm. The organization is still looking for groups of friends or families who want to sign up to play for a cause. Fundraising coordinator, Aneka Wagner said the bowling campaign is a great way for families to get together and raise funds and help out the community while having fun. “One thing that I think that would be really cool is this is a good time for parents to take their kids and do something fun with them, and go bowl and at the same time teach them to give back to their community. So for me this is one of those things i think it would be great to see families come out and do that. It’s a great way to teach your kids the importance to give back to the community and to those who are less fortunate and are going through a difficult time,” Wagner said. If you’re interested in taking part of this campaign and want more details please contact friends together at 989–356–3231. There are currently 6 more lanes available. You can pick up packets to sign up at friends together or at Thunder Bowl Lanes. ‘All Aboard’ Fundraiser Ready, and Set to Go!